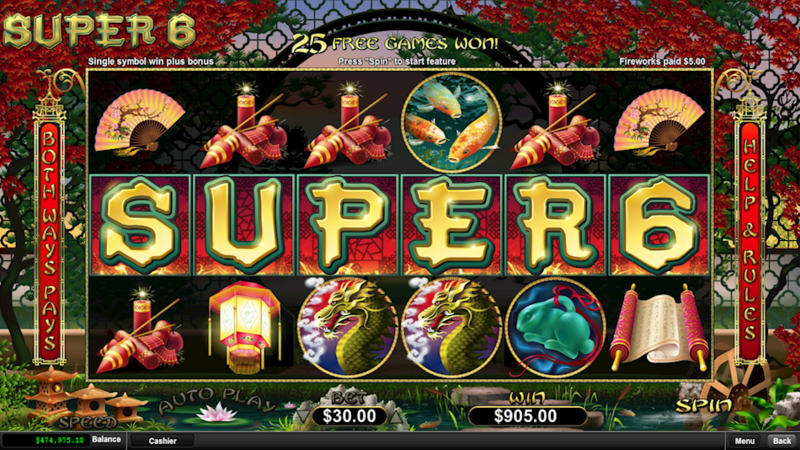 Super 6 is the latest slot release from Real Time Gaming, it boasts beautifully crafted Asian themed graphics and symbols, such as fishes, lanterns and lotus flowers amongst many others. Set against a colorful background in the form of a Chinese garden, this slot really stand out in a market full of oriental themed games. The game has a six reel layout in conjunction with an any ways wins format, meaning that the 6th reel takes on great importance to the amount of combinations that are possible. To trigger the basic spins round where prizes are doubled players need to line up any of the four scatters which make up the game name in sequence from left to right or right to left, it doesn’t matter if these are on the same row or not. This is a great aspect of the gameplay which makes doubling prizes all the more achievable. The wild symbol are in the form of coins and grouping them becomes important in this particular slot as anytime a player groups the symbol they will win a prize that is worth 5x the trigger bet while all prizes are doubled. To improve things even further the scatter symbol open the possibility for payline wins and opens up the chances on hitting the big money through the bonus feature. Free spins can be won by having a minimum of three scatter symbols, which significantly improves the chances of winning high amounts. Hitting four, five or six scatters will trigger further free spins which in turn leads to even bigger cash wins. This option drives home the message that this release really is worthy of its title of Super 6! With its great payouts, wonderful gameplay and user friendly interface this slot will be a big hit within the slot community.